Oslo has a ski zone within the metro network. Tryvann hovers near the north-west terminus of Line 1. 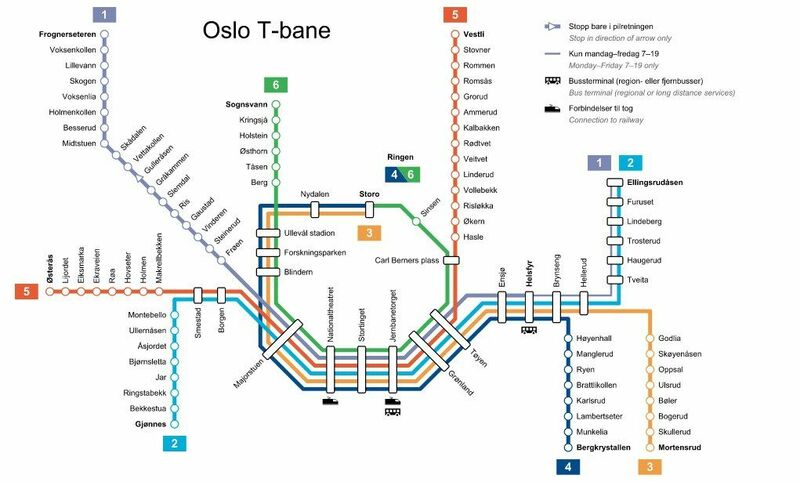 Skiers should catch a T-bane train towards Frognerseteren, alighting after thirty five minutes at the penultimate stop, Voksenkollen, and taking the shuttle bus to the ski park. Though not vast, with fourteen slopes (green, red and black), Tryvann will fill a day. The resort is open 10am-10pm on weekdays and to 5pm at weekends (340 NOK (£34) for day pass). On the way back, stop at Holmenkollen, four stations down the line, where a 210 ft ski jump formed the centrepiece of the Nordic World Ski Championships. You can go to the top as part of the 100 NOK (£10) entry to the Skimuseet. Oslo is small enough that you can get around on foot, though trams and trains are frequent and worthwhile if you combine them with an Oslo Pass to get into many of the city’s museums. Start by the fjord, at the Operahuset, on Kirsten Flagstads Plass. Norway’s home of opera was inaugurated in 2008 and is a striking structure of granite, marble and glass, resembling two slabs of ice (visit from 11am-11pm on Saturdays, 12pm-10pm on Sundays and 9am-11pm on weekdays. Tours in English run on Saturdays at 12:05pm and Sundays at 12:30pm for 100 NOK / £10). From here, cut through Christian Frederiks Plass to Jernbanetorget, and turn west along Karl Johans gate. The city’s main drag is dotted with landmarks such as Stortinget, Norway’s Parliament, and Universitetet, Oslo’s university. Walk to Slottsparken and the Slottet, home to the Norwegian royal family. Bogstadveien and Hegdehaugsveien are Oslo’s two major shopping streets that spear back to the centre from Majorstuen. The latter has the Moods Of Norway Super Duper Store at number 34 – the flagship branch of the Norwegian fashion brand. Elsewhere, GlasMagasinet is a department store that has stood on its site, at Stortovet 9, since 1739 . And Aker Brygge is a modern shopping mall at Stranden 3a that ranks as one of the shining lights of the revitalised waterfront . Grab a beer at Oslo Mekaniske , a popular drinking den in a former mechanics workshop, at Tøyenbeken 34 in the up-and-coming Grønland district. Around the corner, at Rubina Ranas Gate 3, Vognmand Nilsen does a fine deer fillet (285 NOK / £29). Delicatessen at Søndre Gate 8, in the Grünerløkka area, serves tapas with a Norwegian twist (72 NOK / £7.20). Cafe Bacchus at Dronningens Gate 27, serves excellent open sandwiches (148 NOK / £15). Litteraturhuset, an arts centre at Wergelandsveien 29, has a welcoming cafe that does a hearty fish soup (98 NOK / £10) and spicy herring with potatoes (125 NOK / £12.50). The main shrine to Edvard Munch is north-east of the centre, in the Gamle Oslo area: the Munch Museet at Toyengata 53. It contains 1,100 works by Norway’s most iconic painter (open 11am-9pm on Sunday, 10am-4pm Tuesday, Wednesday and Friday, 10am-9pm on Thursday and 11am-5pm on Saturday; entry costs 75 NOK / £7.50). 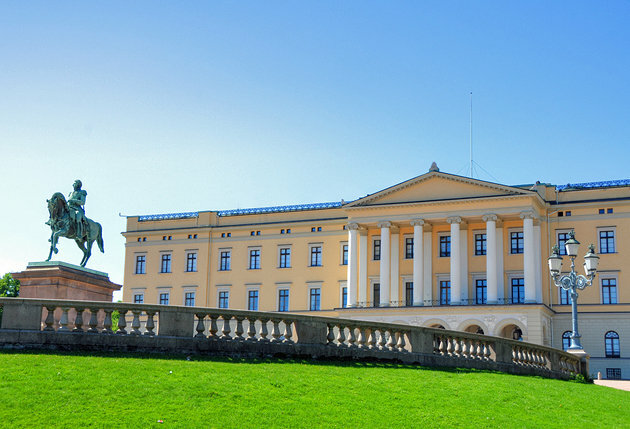 Alternatively, his greatest hits (versions of Madonna and The Scream) are at the Nasjonalgalleriet, Norway’s National Gallery at Universitetsgata 13 (free; weekends 11am-5pm; Tuesday to Friday 10am-6pm, Thursday to 7pm). Ibsen, too, has his moment, at the Ibsen Museet, within his old home at Henrik Ibsens Gate 26. (open 11am-4pm daily, Thursday to 6pm, except Monday; 85 NOK / £8.50). The Nobels Fredssenter or Nobel Peace Centre occupies an old railway station on the fjord at Radhusplassen. It hosts an exhibition on the current laureate, and offers insights into previous winners (open 10am-6pm daily except Monday for 80 NOK / £8).